There’d be a lot more plesiosaurs in the fossil record, if it wasn’t for all the damn zombie worms. At least, that’s one interpretation of a new study, which shows that Osedax, better known as the zombie worm, devoured the bones of marine reptiles 100 million years ago. Osedax is a fascinating (horrifying) creature that can be found today dining on whale carcasses at the bottom of the ocean. Using root-like tendrils that squirt bone-dissolving acid, zombie worms bore into the skeletons of fallen whales, slurping out the juicy collagen inside. Because whale bones constitute their primary food source today, scientists supposed that the worms co-evolved with whales some 45 million years ago. But a paper which appears in the Royal Society journal Biology Letters this month suggests otherwise. 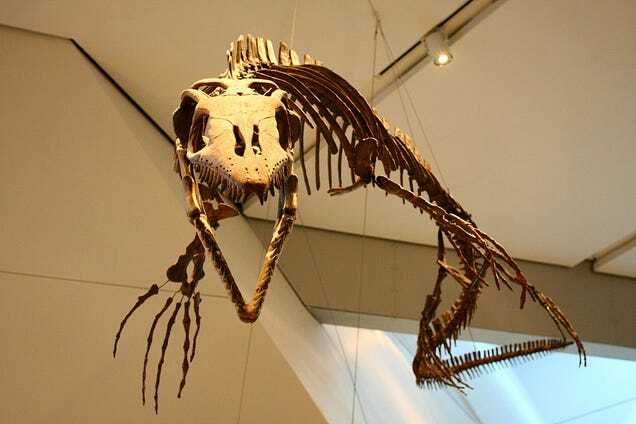 Using X-ray tomography to analyse fossil fragments of a plesiosaur and a sea turtle, researchers at Plymouth University found the bones to be riddled with telltale zombie trails. Higgs says that the true extent of the “zombie worm effect” on the fossil preservation now needs to be assessed for all marine vertebrates in the Cretaceous. Of course, palaeontologists already knew that the fossil record isn’t perfect—there are many factors, including climate and geology, that affect preservation. Still, it’s fascinating to think that a little bone-eating worm may have profoundly shaped our understanding of the ancient Earth. Read the full scientific paper here.